Mascarpone is a sweet dream of spreadable cheese. Born and raised in the Lombardy region of Italy, Mascarpone is quite well-travelled these days. In Wisconsin, we can’t get enough of our state’s farm-fresh, rich, cultured-creamy mascarpone. We enjoy its subtly-sweet yumminess year-round in all sorts of desserts and baked goods, including its most famous Italian dessert partnership, tiramisu. 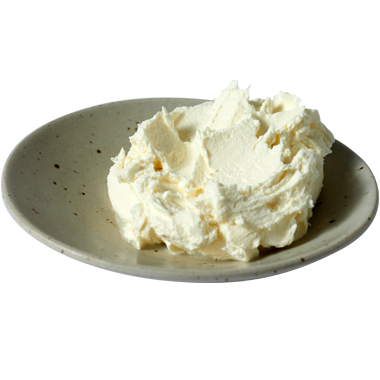 Don’t over-whip or over-process mascarpone when making frostings, dips or spreads with it, because it will churn into butter and get lumpy. It’s a fresh cheese, so enjoy it fresh, and don’t keep it around for too long. That said, Wisconsin’s mascarpone is generally fresher than imported varieties, so it usually has a longer shelf life. Drinks that like sweets like port, grappa, fruit liqueurs, fruit ales and hard cider all like mascarpone. However, avoid dominantly hopped beers or deeply tannic wines at all costs. Tiramisu isn’t tiramisu without this luscious, sweet, spreadable cheese. We love it in many other desserts as well. It’s also really yummy in a baked Italian torta layered with gorgonzola and chopped pine nuts. In the summer, we love to grill fruits and serve them drizzled in honey with a generous dollop or two of mascarpone.